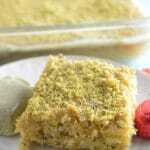 Semolina bars filled with delicious creamy Ashta. 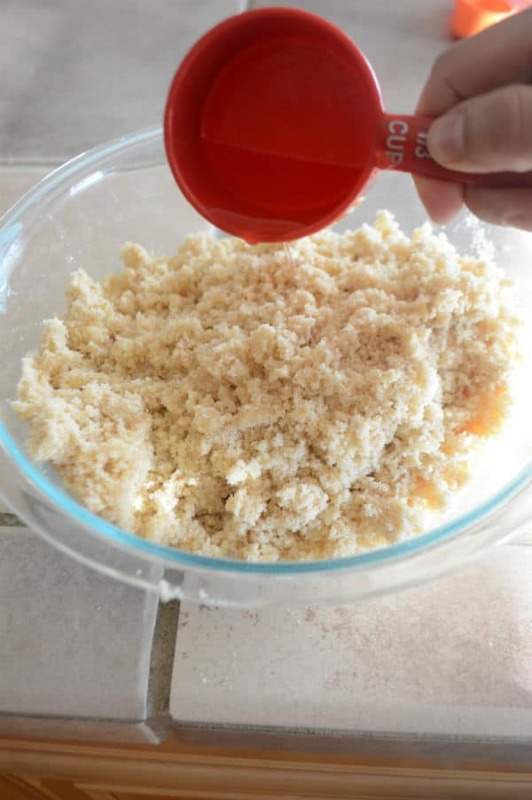 One of the best semolina flour recipes I’ve ever had. 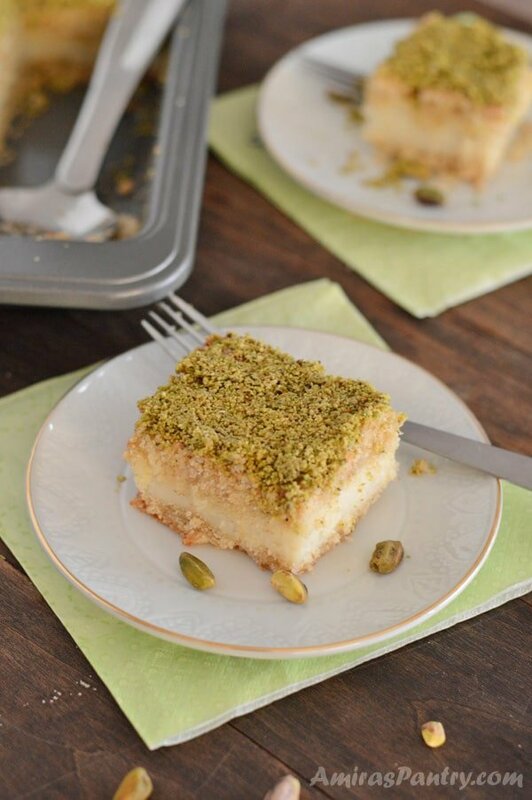 A delicious Lebanese treat with a new ashta recipe. 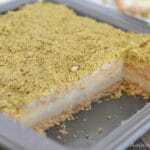 These are special Lebanese treat, one of their specialty desserts that shows up in the holy month of Ramadan. Creamy white filling sandwiched between crunchy, buttery semolina layers. These have a very distinct flavor and texture. Today is the first day of Ramadan, I probably will be fine until 3:00 may be 4:00 PM. Then, my guess is, I will suffer caffein deprivation. Afterwards, probably I will be on the couch until 8:15 which is the time we break our fasting day :). Although I practiced caffein controlled life that last couple of days, but still I know I will get headache may be later in the day. Do not worry, I’ve been through this many times before and it lasts for the first couple of days then, Ramadan days become easier and easier. Life has been very busy in my little home lately, finishing school year with lots of activities and tests for the kids. Spirit week, fun days, field days, and graduation!!!. My soon to be a freshman is having lots of graduation things. Like ceremony, party, Elitch gardens day… and so on. Lots of pictures taken and parting with some Middle school friends, teachers are crying … this is so emotional. I never knew that Middle school has graduation now :). Not to mention preparing for our summer trip to Egypt, it is really getting super busy here. With all this stress- adding to the caffein deprivation 🙂 – everybody needs something sweet. 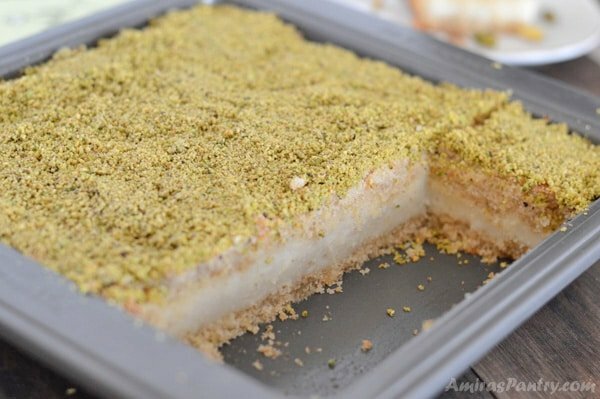 I believe Lebanese people are masters in Middle Eastern desserts along with the Syrians. 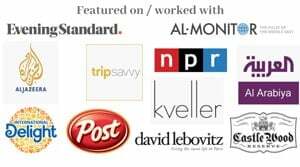 I love everything they do, but just drop down the rose water a notch to accommodate my family’s taste. These bars/squares are heavenly good, we all loved them and this recipe is so easy to make too. Let me show you how. 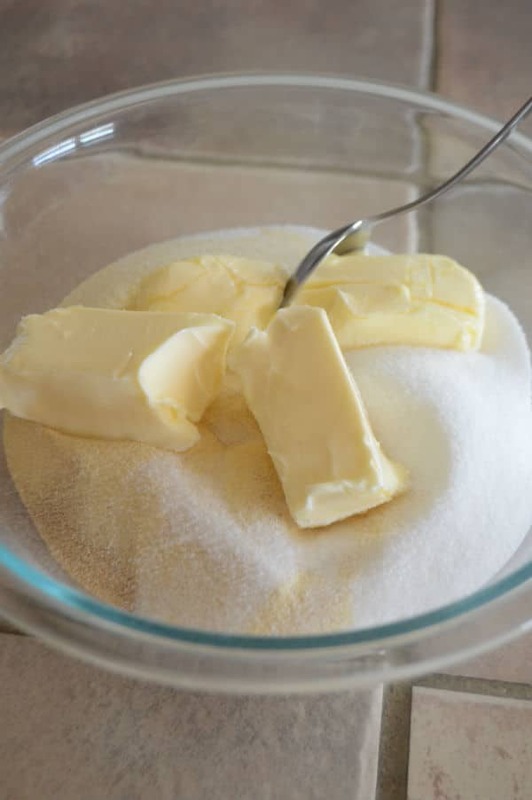 In a deep bowl, we will add all the flours, sugar, butter and yeast. 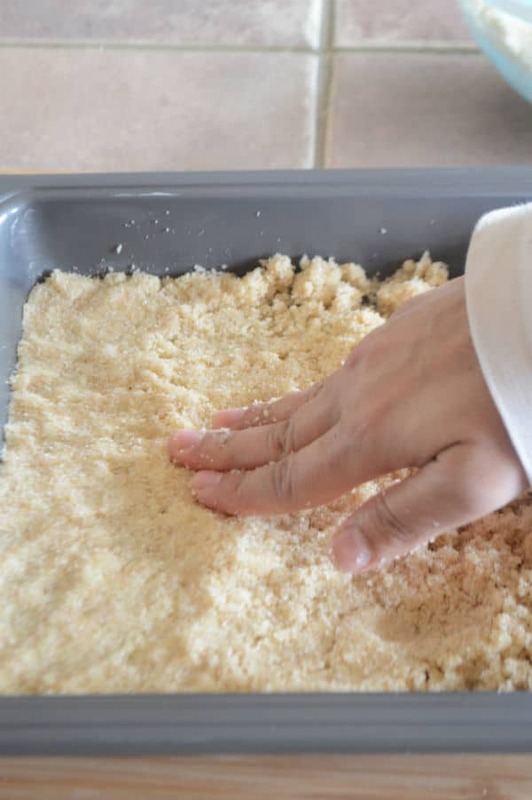 Mix them well with a spoon first, then rub between your hands to make sure that flour granules are all covered by butter, them mixture will be like sand. Add rosewater and orange blossom water, mix well then set aside covered for an hour. Meanwhile, we will make the Ashta by combining all its ingredients. Until it becomes thick, turn off the heat and let it cool down. Press half of the mixture at the bottom of the prepared oven dish. Then press the other half on top, you can moisten your hands with cold water to make this process easier. Bake in the oven until golden brown. Now, some people prepare simple syrup and pour it over the Ma’amool, but really I did not think it needed all that sugar. The dough itself has enough sugar and the filling is made with sweetened condensed milk, so my guess is, you will not need more sugar. I garnished mine with ground pistachios, which is the most common way, but of course it is your call. 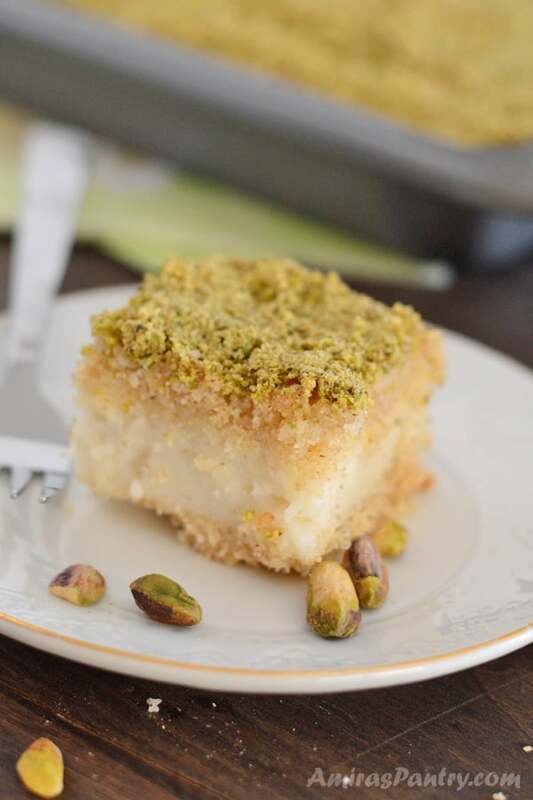 Also I’ve seen Ma’amool mad filled with agwa paste and also a pistachio filling made with coarsely ground pistachios, condensed milk, rose water and orange blossom water. 1 cup butter , room temperature. 3 Tablespoon orange blossom water. 2 teaspoon orange blossom water. 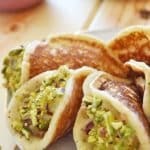 **For garnishing: ground pistachios , I used around 1 cup. ***For serving: 1/2 cup Simple Syrup. 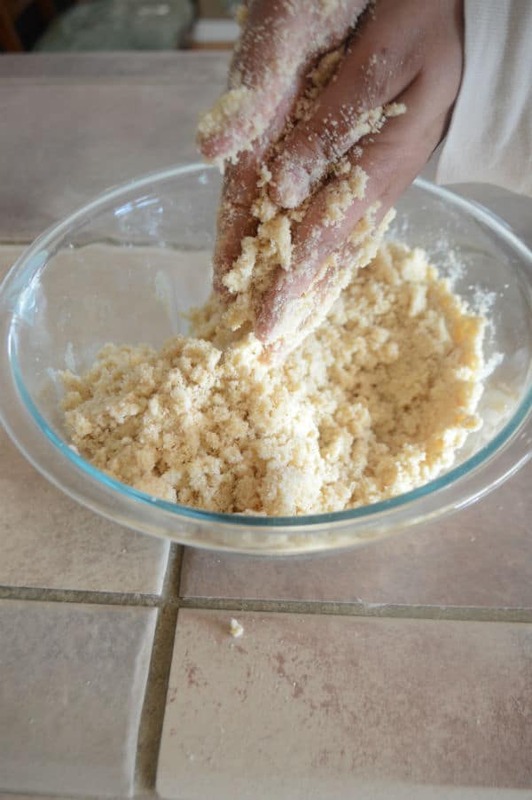 In a deep bowl, combine first 5 ingredients mixing very well with your hands to cover all the granules with butter. Add rose water and orange blossom water and mix. Cover and let it rest for an hour. Meanwhile prepare the filling, in a deep pot over medium heat boil 2 1/2 cups of water. 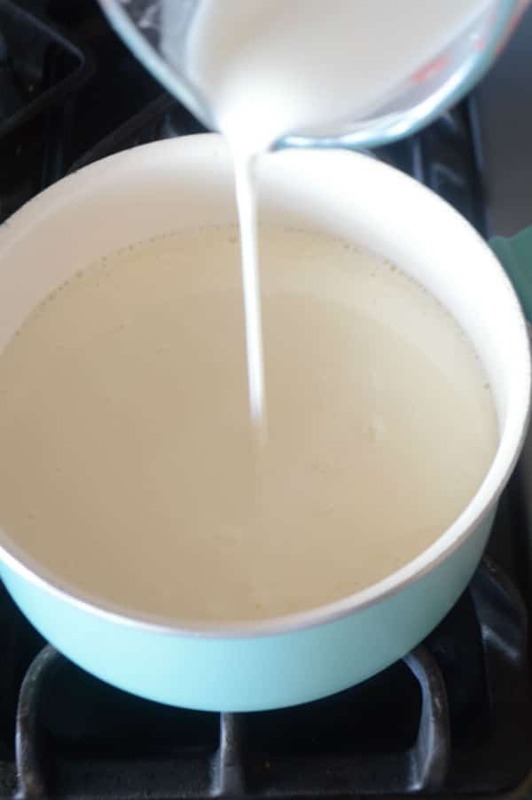 Add the condensed milk and stir to combine. 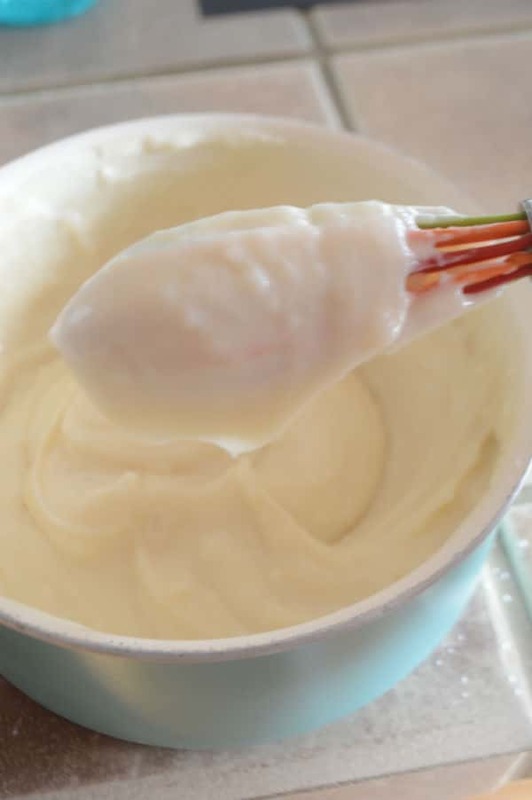 In a separate bowl add the starch to the remaining 1/2 cup of water stirring vigorously with a whisk. Pour the starch mixture to the pot and stir with the whisk until it is smooth and no visible lumps is forming. Keep stirring for 2-3 minutes until it thickens, this happens real quick. Remove from heat, set aside to cool down a bit. Preheat oven to 325F. for dark pans and 350 for glass and shiny pans. 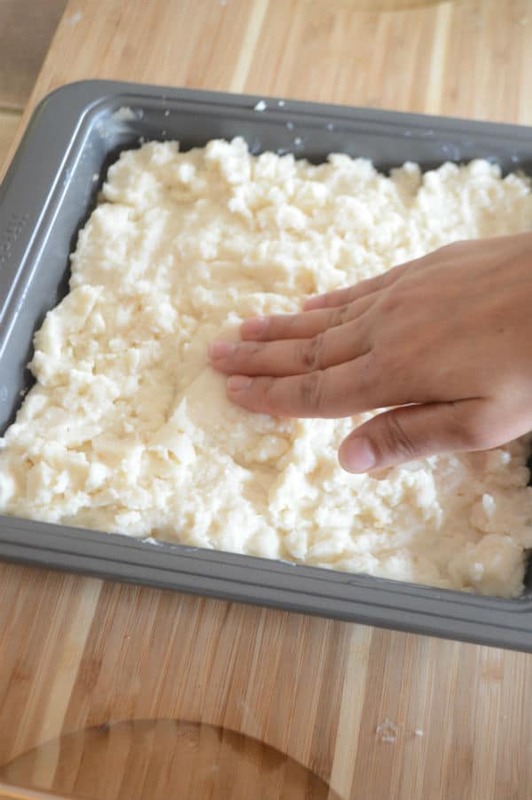 Prepare a 9x9 oven pan, by brushing it with some butter from sides and bottom. Press half of the semolina mixture on the bottom in a uniform thick layer. 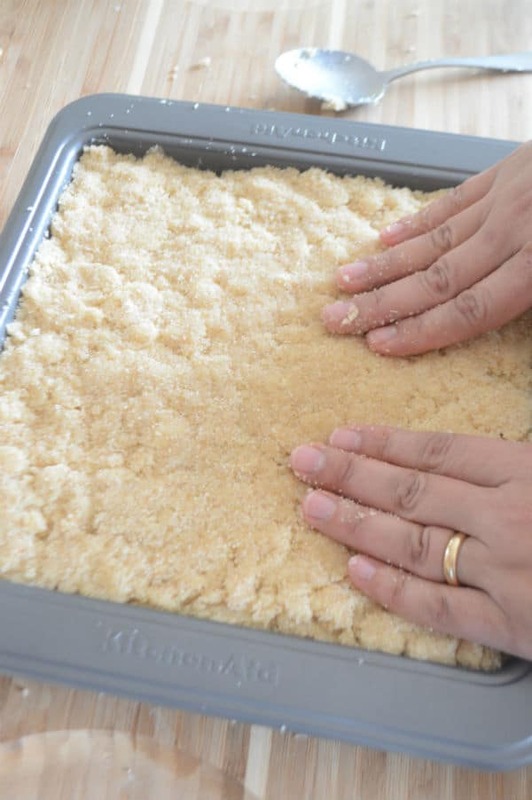 Add the remaining semolina mixture and press gently with your hands. Bake in the oven for 30-40 minutes or until it browns nicely. 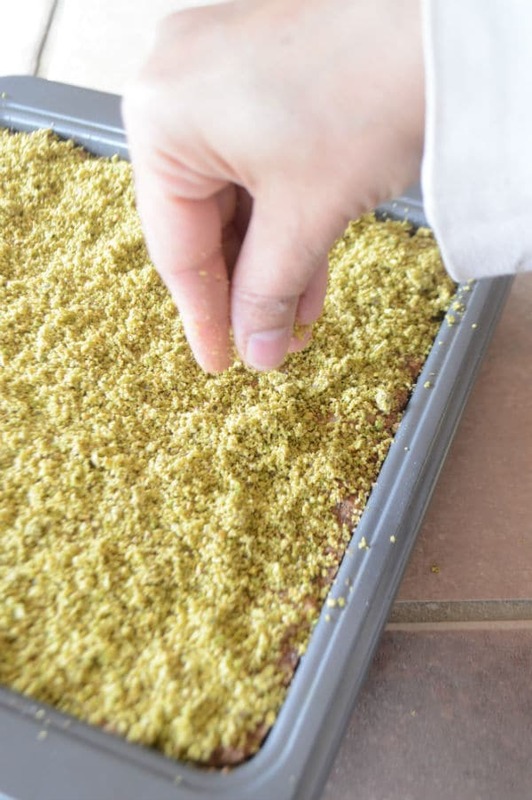 Take it our of the oven and sprinkle some ground pistachios on top. Let it cool down completely before cutting and serving. 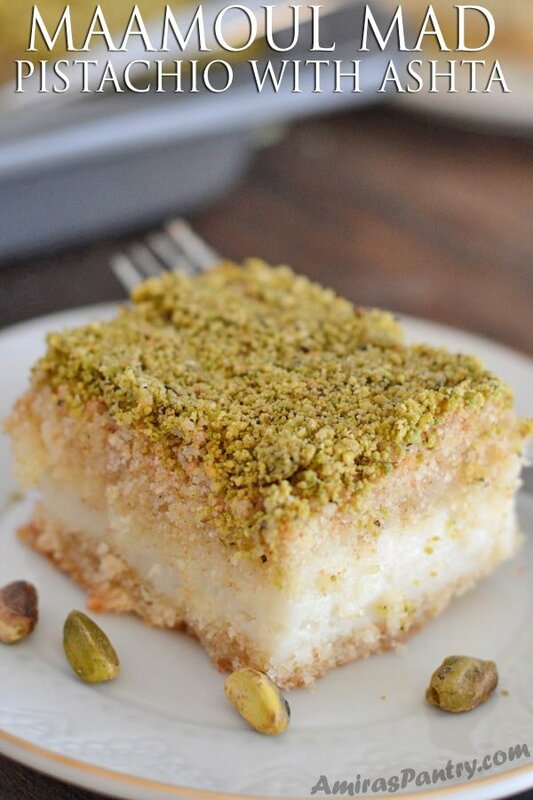 * Life happens, so if you left your Ashta too long and it became too thick to pour just scoop it over the mixture, wet your hands with cold water and press gently against the semolina layer to smooth. ** Garnishing is optional but highly desirable and recommended. *** You may want to serve this dish with some simple syrup on the side. Personally. 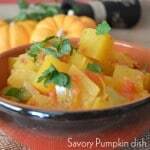 I’ve found this recipe just right for me and did not need any extra sweetness. Is there any substitute for farina flour? Unfortunately no, in this recipe it is a key ingredient to give it its texture. Will try to ask around if anyone has an idea but I do not believe so. Sorry about that.